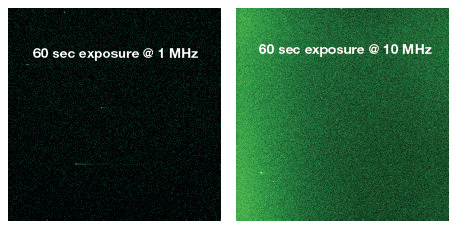 Figure 1: (A) shows DARK IMAGES taken at x1000 gain at different cooling temperatures, 29 ms exposure time. Vertical shift speed was 0.5 µs/ row to ensure minimal CIC. (B) shows typical line intensity profiles across a row of 512 pixels, taken from such dark images at three different cooling temperatures. The cleanest noise floor is clearly seen under conditions of deep cooling, even for such short exposure times. On harnessing EMCCD technology, darkcurrent is an absolutely critical parameter to minimize, more so than in a standard sensitive CCD. The reason for this is that thermally generated electrons are amplified by EMCCD just as photon-generated electrons (signal) are amplified. For optimal sensitivity in EMCCDs, thermoelectric cooling of the sensor must be deep enough that this noise source is virtually eliminated. It is important to recognize that this point applies very much to short exposure operation also; the sensor readout process alone results in significant darkcurrent production if left untreated. 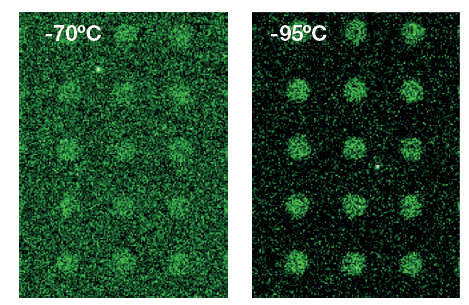 Figure 1(A) shows two dark images taken with a 512 x 512 back-illuminated sensor (from E2V) at two different cooling temperatures; -80°C and -30°C. All are in frame transfer mode at the maximum frame rate of 34 full frames per second, i.e. ~ 29 ms exposure. EM gain is set at X1000; at such an EM gain setting the vast majority of darkcurrent and CIC events will be exposed. The speckled 'salt and pepper' noise pattern that is quite obvious in the -30°C condition is due almost entirely to amplified darkcurrent electrons. Note that each of these images has ALREADY been optimized for minimal CIC, so only the effect of cooling is being demonstrated. If CIC had not been minimized, the -30°C situation would have appeared bleaker still, with an extremely dense 'EMamplified' noise floor. As an alternative view Figure 1(B) shows a line intensity plot from a single row from each image; the readout noise is visible as the fuzzy baseline of each trace with the darkcurrent 'spikes' sticking out of it; this is just what we expect. These spikes, or background events, are what set the remaining detection limit of the camera, not the readout noise. Figure 2: Images of extremely weak LED signal (signal intensity typical of weak luminescence experiments) acquired with iXon 888 at cooling temperatures -70°C and -95°C (water cooling to achieve latter), 120 sec exposure times, subregion show. The need to push to such deeper cooling temperatures can be readily observed under such extreme low light conditions. It is instantly clear that cooling is beneficial. The performance at –80°C is by far the best and there is no way that this level of low noise detection limit can be achieved at -30°C, under any circumstances. It is important to note that even with a short exposure time, the -30°C background events are predominantly from darkcurrent. As such ,we are clearly better off with much deeper cooling, regardless of exposure time. Single thermal electrons are amplified by the EMCCD gain mechanism. Deep vacuum TE cooling is critical to optimize the sensitivity performance of backilluminated EMCCD sensors, otherwise the raw sensitivity will be compromised, even under conditions of short exposures. Figure 3: Dark noise background at 1 MHz and 10 MHz readout speeds; 60 sec exposure and -70°C cooling. Deep TE cooling can also make a tangible difference to signal to noise ratio for longer exposure conditions. Figure 2 shows extremely low light images, recorded at -70°C and -95°C with the iXon 888 on a light tight imaging chamber using weak LED illumination through pinholes. The light levels used are typical of an experiment involving imaging of weak luminescence signal. The photon flux is so low, that a two minute exposure is required in order to visualize the pinhole signals. It is clear from the significantly improved SNR, and therefore contrast, at -95°C cooling, that such extremely low cooling temperatures are recommended for longer exposure acquisitions. 1 MHz EM mode readout limits background of long exposures When back-illuminated EMCCD sensors from E2V are read out at faster horizontal speeds, such as 10 MHz, the EM-amplified background becomes notably higher over longer exposures. A slower 1 MHz readout mode is required to minimize background under these conditions. This is not so apparent for shorter exposure times (e.g. < 1 sec) but when you go towards multiple secs to mins it is certainly apparent. Some example dark noise images are show in Fig 1 and Fig 2 for two different cooling temperatures, taken with the iXon 888 camera at x1000 EM gain. This basic trend can indeed be considered an oddity, because you would intuitively imagine that the readout speed should not influence the noise background that is built up during the exposure, but nevertheless it is fact. This means that we recommend using a readout speed of 1 MHz for longer exposure times. This is not really disadvantageous since you have already compromised the frame rate with the longer exposure time. For shorter exposure times/faster frame rate measurements, it is still best to opt for 10 MHz readout speed because darkcurrent (being time dependent) is lower and CIC is the prominent contributor. Since CIC is elevated by use of slower readout parameters, then are better using 10 MHz. Also, you tend to need the faster readout speeds to achieve faster frame rates. A slow readout 1 MHz mode is required to minimize EM-amplified background under longer exposure acquisition conditions.